Here at TenantCloud, we want to make renting easier for both landlords and tenants. 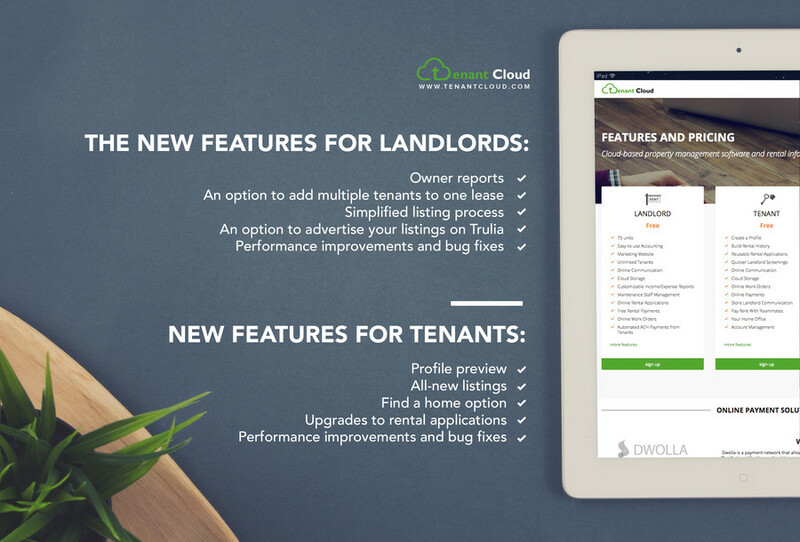 We’ve recently released the updated version of TenantCloud with a bunch of new features and bug fixes. Tenants now have the ability to find their perfect home right in their account with a list of all new Real Estate listings. At the same time the listing process was streamlined for landlords. Now you can list your unit in a few clicks with an option to advertise listings on Trullia, the biggest real estate listing website. We've also added the owner reports for landlords and an option to add multiple tenants to one lease so now you can keep track of all residents! Tenants can now preview their profile which makes the application process more user-friendly. Moreover, landlords and tenants can pay and collect rent for free with Dwolla payment system, no more transaction fees for anyone! P.S. Currently TenantCloud team is working on the all-new portal for landlords with brand-new structure and interface. Let us know if you have something you would like to see there, the new portal is coming later this summer.